I know it’s pathetic but I was looking through my old clippings last week and I stumbled upon the first menu I ever wrote for the Los Angeles Times (it’s here if you’d like to see it). It had a Spanish vegetarian theme and featured empanadas, garlic soup, and a great Catalan dish with grilled vegetables (which I love) marinated in vinegar. It’s called escalivada. I’ve always been a vinegar nut too, having discovered the joys of French fries and malt vinegar at an early age (thank you Dairy Queen) and still frequently indulging in bags of salt & vinegar potato chips (thank you Trader Joe’s). So vinegar and grilled vegetables was win-win for me. If I could turn it into a soup, I’d have the trifecta. It was worth a try, although the grilled asparagus soup I made a few weeks ago hadn’t worked out so well. It had been for last month’s multi-course Italian meal, but hadn’t made the cut. Too “grilly” was the consensus. (No, it’s not really a word.) Could the same fate await my escalivada soup? Maybe. But the weather was egging me on. It was the middle of May and spring had officially arrived in Illinois. And the prospect of no frost for the next 5 months (keep your fingers crossed) meant whipping the cover off the grill and getting down to business. There wasn’t too much prep work for the grilling, just slicing the vegetables down to size: strips of zucchini, squash and eggplant (thank you mandoline) and quartered peppers and onion all tossed in minced garlic and olive oil. Then it was just a matter of slapping them on the grill to give them a little color and setting them aside to cool. Not too bad, except for the fact that we hadn’t really started making the soup yet. Happily, the soup part was really easy: Chop the vegetables into small pieces, put them in a pot, add stock, vinegar and seasoning, simmer, and… done. It was then that they floored me by saying how much they thought the soup was like ratatouille. All of a sudden a light bulb went on over my head. The fact that both escalivada and ratatouille are the only eggplant dishes I like wasn’t enough for me, nor was the fact that these two Mediterranean dishes are made from the exact same ingredients (a little extra thyme for the French version, a little vinegar for the Spanish one). I had to have my nine-year-old connect the dots for me. They’re essentially the same dish. The only difference being that few hours difference along the French/Spanish Riviera. All in all, though, this week’s recipe is the one I prefer. It’s got a bit more zip, a bit more tang, a lot more of the fiesta. I don’t know where they run with the bulls (I know it’s Pamplona. I just don’t know where in Spain that is. ), but it could never be in France. It could probably never be here either. Yet, in lieu of the bull, I offer you this soup to put a little spring in your step. And all you have to do is say olé. Preheat the grill on high. Toss the vegetables together with the minced garlic and oil and grill them on both sides until they get some nice grill marks. As you remove the vegetables from the grill, place them in a bowl covered with plastic wrap. This achieves the double task of keeping them warm and steaming the skins off the bell peppers. 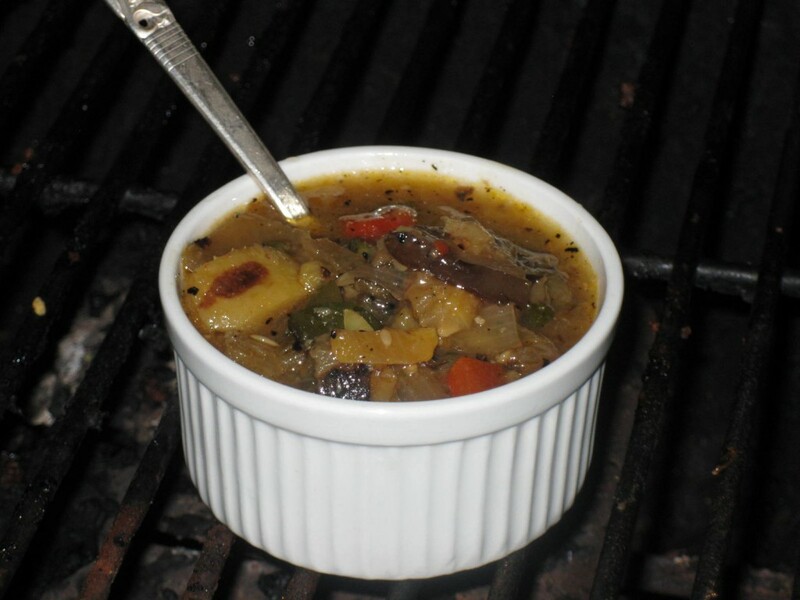 Chop the cooked vegetables into small pieces and place in a 3 quart soup pot with the vinegar, stock and seasoning. Bring the soup to a boil, then reduce it to a simmer for 20-30 minutes. Serve it with all the other grilled delicacies you’ve been waiting all winter to make. Image Credit: “Grilled Soup,” by the author. Since I’ve owned a gas grill, I am sad to say I’ve lost touch with the beauty and flavor of charcoal grilling. I enjoy the convenience so much, though, that I’m not going back anytime soon. What can I do to have the best of both worlds? What do you do?